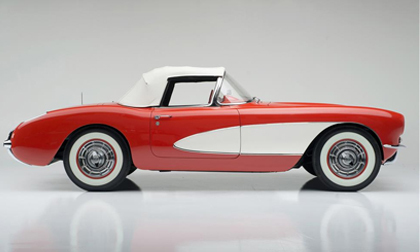 SCOTTSDALE, Ariz. – Dec. 2, 2015 – Barrett-Jackson, The World’s Greatest Collector Car Auctions®, is set to light up the auction block with an eclectic docket of Chevrolet Corvettes during the nine-day 45th Anniversary Auction from Jan. 23-31, 2016, at WestWorld of Scottsdale. Among these highly sought-after American cars are three VIN #001 Corvette convertibles from 1955-1957, a 1954 roadster that was entombed until 1986, as well as two of the greatest original 1967 427/435s to ever cross the block. Three VIN #001 Corvettes from 1955, 1956 and 1957 will cross the auction block at the 45th Anniversary Scottsdale Auction. The 1955 convertible (Lot #1351), wearing a Polo White exterior, features a 265ci V8 engine and scored a 99.3 that led to a 2008 NCRS Top Flight award. The Venetian Red and white 1956 convertible (Lot #1352) features the first dual 4-barrel production engine and is rated at 225hp with a special solid-lifter Duntov 098 camshaft. The third VIN #001 Corvette is a 1957 Cascade Green and beige convertible (Lot #1353). It was not only the first production 283ci Corvette, but the first production 283ci Chevrolet vehicle with the majority of the components dated July 1956, including the engine, transmission and differential. Among the most anticipated Corvettes set to star at the 45th Anniversary Scottsdale Auction is the famous “Entombed” Corvette. This 1954 Corvette roadster (Lot #1279) was owned by Richard Sampson, a successful business man in Maine who entombed the car in a brick and mortar vault in 1959. It was removed by Sampson’s daughter in 1986 and has been preserved ever since. An amazing piece of American history, this Corvette has the same 2,335 miles that were on the odometer when it was finally saw daylight again, 28 years after its entombment. Originally owned by musician Freddie Haeffner, this 1967 Corvette 427/435 convertible (Lot #1372) has been nicknamed the “Music Car.” Purchased in 1967, it was used to promote Haeffner’s band in car shows and parades until 1987. The Corvette has received multiple Bloomington Gold certificates, is part of the Bloomington Gold Hall of Fame, is also a five-time NCRS Regional or National Top Flight award recipient and was awarded the coveted NCRS Duntov Mark of Excellence. Documented by GM Corvette Order Copy, this Rally Red Corvette, as originally built, still retains a close-ratio 4-speed transmission, 3.55 posi-traction, F41 suspension, telescopic steering column, power brakes, N89 bolt-on wheels, side exhaust, transistor ignition, 7.75×15 Firestone non-DOT red line tires, tinted glass, AM/FM radio and the original white soft-top. Alongside the “Music Car” is another very rare, original 1967 427/435 Corvette coupe (Lot #1371). It is one of very few documented 1967 435s produced in Tuxedo Black with black leather interior. This Corvette features the original drivetrain, Window Sticker, Tank Sheet, interior, paint and GM Trim Tag validating the color combination.Under the hood is a factory-original 435hp engine and 4-speed close-ratio transmission, along with a factory-original side-exhaust. It is one of the most well-preserved, low mileage, unrestored 1967 427/435 coupes in existence. To preview additional Chevrolet Corvettes consigned for the 2016 Barrett-Jackson 45th Anniversary Auction in Scottsdale, click here. For more information on becoming a bidder, follow the link to www.barrett-jackson.com/bid. Experience the 45th Anniversary Scottsdale Auction in style with a Barrett-Jackson VIP Experience Package. Information on available packages and how to be a part of this world-class lifestyle event is available here.